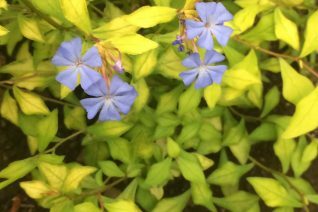 Striking gold leaved perennial that pairs bright blue flowers for a bold effect. Blooms from late July to October on a spreading, sprawling plant. Freezes to the ground in most winters and returns from the base if in rich, well drained soil in full sun. Excellent perennial in containers. To 1′ tall by 2 wide in a season. Regular summer water. Foliage does not burn in sun. Mulch in autumn. Do not cut back until you see new growth in spring. Then remove winter killed stems. Hardier to cold in rich, very well drained soil. Often overwinters in containers. Striking perennial for contrast, brilliance. 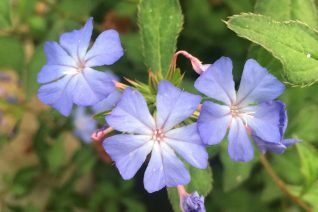 AKA Chinese Plumbago.